The box office success of Teen Wolf owes a lot to Back to the Future. The Michael J. Fox-starring comedy was released in August of 1985, just a month after Robert Zemeckis' time-travel adventure became a smash hit. Between BTTF and the sitcom Family Ties, America was all about Fox by that time. Teen Wolf would go on to spawn a sequel and, years later, an MTV drama. 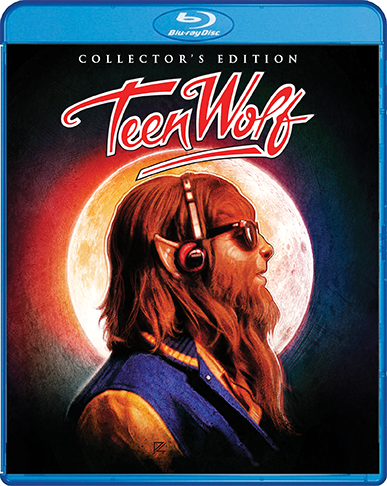 Scream Factory releases the movie and its follow-up, Teen Wolf Too (reviewed here), in collector's edition Blu-rays on August 8. Fox plays high school student Scott Howard. He's a member of the losing basketball team, he can't get his dream girl to notice him, and oh yeah, he's part werewolf. Once Scott discovers, and embraces, his special gift, things change. He becomes popular. His hoops skills improve. That dream girl pays attention. Scott's buddy Stiles (Jerry Levine) is more than happy to ride his coattails, while loyal gal-pal Boof (Susan Ursitti) finds herself dismayed by his change in attitude. Scott goes from nice guy to self-obsessed jerk. Eventually, he realizes this about himself and tries to rectify the situation. The plot of Teen Wolf is nothing special. It's a standard teen comedy about how Scott thinks being a werewolf makes his life better, only to discover that he has the power to do that without becoming lupine. The reason it works – and has maintained its popularity all these years – is because Michael J. Fox really sells the material. He gives a charming performance that makes us care about Scott, whether he's in human or werewolf form. Fox makes everything funnier than it might have been, thanks to his impeccable comic timing and physical comedy skill. The makeup effects hold up surprisingly well, allowing us to recognize the actor even though his features are mostly covered. This sort of thing can be overdone, obscuring the person underneath all the prosthetics. Here, that doesn't happen, which ensures we know this is the same character, even when he's in wolf form. Because of this, the coming-of-age element in the story feels relatable, though rooted in fantasy. Teen Wolf remains just what it was in 1985: an innocuous but amusing teen flick with a twist. It's still a great deal of fun to watch. Scream Factory's collector's edition Blu-ray is, in a word, remarkable. The film is presented in a new high-definition transfer that looks exceptionally good. The original theatrical trailer and a still gallery are included on the disc. The highlight, however, is “Never. Say. Die. The Making of Teen Wolf.” This retrospective documentary runs 143 minutes. Keep in mind, that's almost a full hour longer than the feature itself! Everything you could ever want to know about Teen Wolf is covered, from the casting to the costumes, the makeup to the music. Likely due to his health problems, Michael J. Fox is not present, nor is late director Rod Daniel (except in archival form). Pretty much everyone else is, though. Cast and crew members not only discuss the making of the movie in substantial detail, they also provide some fun behind-the-scenes anecdotes and examine the enduring legacy of Teen Wolf. Scream Factory has made a name for itself with these kinds of documentaries, but they may have outdone themselves this time. You couldn't come up with something more comprehensive than this. If you like Teen Wolf even just a little bit, this is a Blu-ray you must own. Teen Wolf is rated PG-13 for sexual innuendo and language. The running time is 1 hour and 31 minutes.